DSI's patented network securtiy software sets a new benchmark in the Industry for secure wired and wireless networking. On any given day...as many as 7 million DoD computers and telecommunications tools in use in 88 countries using thousands of war-fighting and support applications. The number of potential vulnerabilities...is staggering. Dispersive Solution’s (DSI) new software product, V2VNet, utilizes its patented technology, Spread Spectrum IP Networking™, which enables the network to route data and communications traffic dynamically from client to client (P2P), or in this case, V2V™ (Virtual Machine to Virtual Machine). When a message, file, video, etc.., is sent from one client to another, the communication (data) is divided up and encrypted. Each encrypted “piece” of the message is guaranteed an independent route through the network, client to client, until all parts of the message arrive at the recipient’s device, where it is decrypted and reassembled. 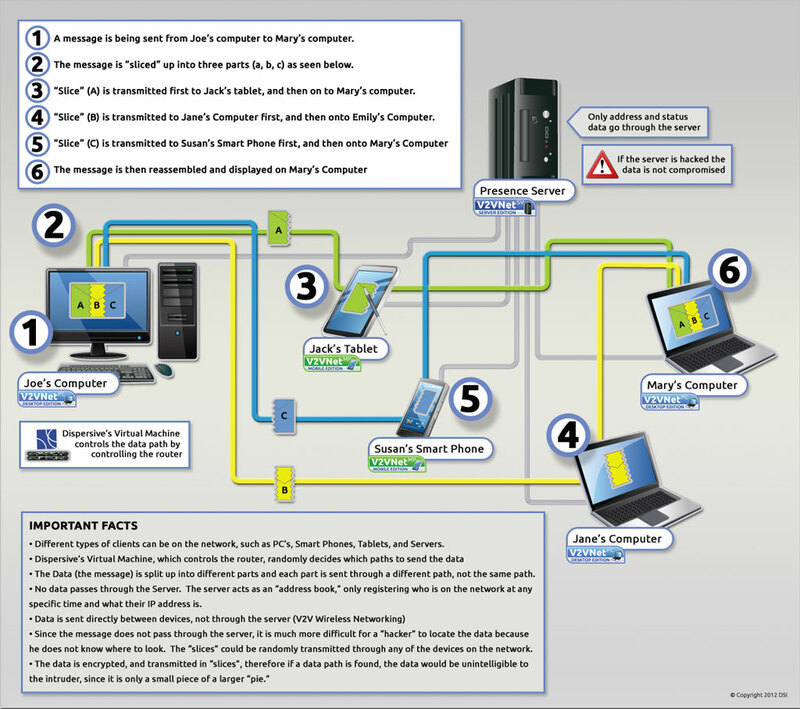 These client network devices include computers, tablets, smartphones, and servers (acting as a client). In addition, V2VNet functions similarly on a network of servers. 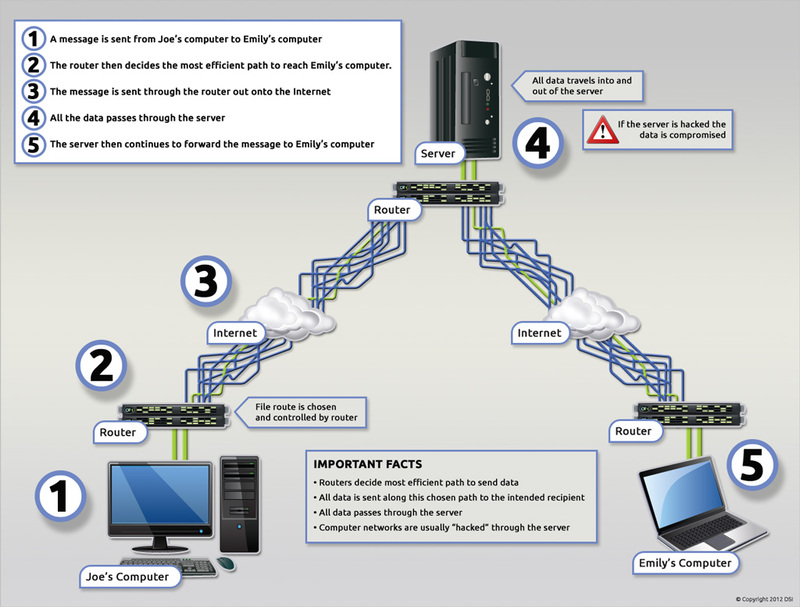 Traditional computer networking creates issues of vulnerability, performance, and bandwidth. With our patented Spread Spectrum IP Networking™, communications applications and data transmission on all platforms converge seamlessly. Each client communicates directly with other clients, securely routing voice, video and data communications between fixed and mobile devices, while forcing multiple independent paths utilizing “deflects” on each path. Our patented technology is unprecedented, and revolutionizes the Network Security industry. The CEO, Robert W. Twitchell, Jr., has an extensive background in the wireless industry. He holds 62 granted patents with many more additional non-provisional patents pending in wireless, GPS, networking, and location technology. He is a Subject Matter Expert for the Department of Defense on Mobile and Wireless Technology. 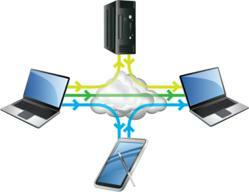 In February 2011, the patent was granted for the Virtual Dispersive Networking Technology. This patent not only exemplifies the uniqueness of this technology, but also positions our companies at the forefront of a Network Security revolution.